This is a ornate sterling silver pearl photo locket and chain. It has a lovely ornate decoration of small pearls and white stones. Stunning Sterling Silver White Mother of Pearl & Marcasite Locket. Wear for all occasions. Love this locket it’s so beautiful and the design is stunning. The weight of this locket is 8.1g Approx. Please message me with any questions. Please note box for display purposes only (all items sent in appropriate wrapping I.e box pouch etc) All items sent 1st class sign for. Please message me for international shipping. Weight (g):70. Signs of age and wear to be expected. Sterling Silver Locket. Stamped 925 for authenticty. Features Black and Red Garnet Stones. Black Box included. 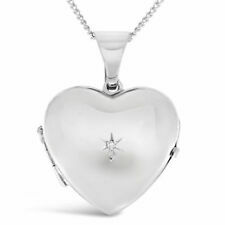 Metal: Sterling SilverStyle: PendantLength: 18 - 19.99"
Heart Floating Locket Necklace made from 925 sterling silver. Includes 925 sterling silver chain. Charm not included. Heart Floating Locket Necklace. Solid 925 sterling silver. Chain length 68cm. Due to health and safety regulations this does not apply to earrings and make-up. New listingVintage sterling silver, locket set with amber, silver chain. Set with a single amber stone, very clean inside. Summary Stunning antique locket. Gold plated. In worn, antique condition. Approx 3cm long including bail. Style: LocketLength: 16 - 17.99"
HERE WE HAVE A BEAUTIFUL LADYS REAL SILVER (925) LOCKET, AND RIGHT IN THE CENTER IS A LOVELY STONE SET GARNET, JUST TO FINISH THE LOCKET OF. THIS LOCKET COMES ON A LOVELY 18” INCH CHAIN, BUT CAN BE EXCHANGED FOR A DIFFERENT LENGHT IF NEEDED. ............................................................................ ALL OUR ITEMS COME BRAND NEW AND WILL BE SENT OUT IN A LOVELY PRESENTATION BOX & BAG. Beautiful Sterling Silver (925) Handcrafted Pendant with a beautifully cut Agate & Amethyst the Amethyst does not show up too well in the pictures. Handcrafted by a traditional Balinese Silversmith. Each pendant is painstakingly hand produced down to the finest detail from quality fine silver. Each pendant is made using traditional methods going back almost 100 years and still of the finest quality you will find. I have enclosed some pictures of the crafting process as you can see no machinery is involved, this is a purely traditional maker don't mistake for mass produced rubbish. 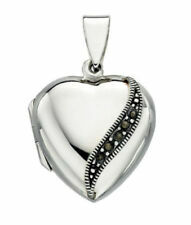 F.Hinds Sterling Silver Cubic Zirconia Heart Locket And Chain Necklace. Condition is very good. Marked 925. Very pretty. Dispatched with Royal Mail 2nd Class. Sterling silver marcasite Locket. Onyx. Sterling silver marcasite Locket. Onyx.. Condition is Used. Dispatched with Royal Mail 2nd Class Large Letter. Silver Marcasite & Malachite Heart Locket. xaod. This beautiful heart locket, crafted in sterling silver, has vibrant blue cubic zirconia. A perfect gift, this sentimental piece of jewellery would be perfect for your loved one . *Sterlin Silver *Cubic Zirconia set *Pendant size H15, W15 *Length of necklace 45.72cm/18in Fast Royal mail delivery EUROPEAN UNION SHIPPING AVAILABLE!! The locket pendant has a removable lid and is 925 stamped. This is an attractive and functional piece of quality jewelry. This silver prayer /photo locket can be worn as a charm and pendant. All faiths use prayer boxes to focus the mind on one’s. Style: LocketLength: Less than 13"
Silver Locket with Garnet Gemstones. Made of 925 stamped Sterling Silver. Free Standard Black Gift Box included. Est. delivery dateEst. delivery Wed, Apr 24Metal: Sterling SilverStyle: LocketLength: 18 - 19.99"
Locket size : 2.5 cm. Engraved Wallet Cards Engraved Keyrings Engraved Bracelets Engraved Necklaces / Lockets Engraved Rings Unusual Jewelry Gadgets / Other Watches Cufflinks Unusual Neckalces/Lockets Unusual Rings Unusual Earrings. The locket plating has a great shine & sparkle. 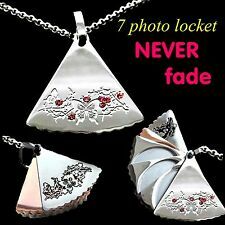 The locket pendant size is: 29mm High by 29mm Wide. We will include afree gift bag with the locket. Locket Pendant Engraved with: I Love You. 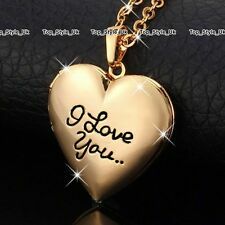 This is a unique beautifulRose Gold Plated Locket which is engraved with‘I Love You’ at front of the heart. Hallmarked sterling silver but I've no idea if it's diamond or CZ so i'm just assuming it's CZ. It seems well made, quite solid with a good hinge. Height with bale is 3.5cm. ATTRACTIVE LOOKING LOCKET WITH HALLMARKS TO THE BACK FOR 9CT GOLD. THE LOCKET HAS A LEAF PATTERN WITH A CLAW SET CLEAR AND BLUE STONED FLOWER TO THE FRONT. THE LOCKET OPENS FROM THE BOTTOM AND LIFTS UP. Large oval shaped Victorian style locket can open so that you can keep your favourite photograph inside. Height of locket approx 3cm. The chain is approx 25cm long. Style: LocketLength: 18 - 19.99"
Beautiful Sterling Silver (925) Handcrafted Pendant with a beautifully cut Agate & Sapphire. Handcrafted by a traditional Balinese Silversmith. Each pendant is painstakingly hand produced down to the finest detail from quality fine silver. Each pendant is made using traditional methods going back almost 100 years and still of the finest quality you will find. I have enclosed some pictures of the crafting process as you can see no machinery is involved, this is a purely traditional maker don't mistake for mass produced rubbish. Figaro link chain also solid sterling silver. The pendant is hallmarked 925 on the inside and just visible under the loop. (5) A solid sterling silver item with real gemstones. The front of the locket is open work with bluebell flowers (?). The locket has a highly polished back. Hallmarks on the locket are AM Ltd, 925 in scales, 925 and leopard face, also 925 is stamped inside locket. Charming and romantic sterling silver locket made from sterling silver and abalone, on a sterling silver box chain. 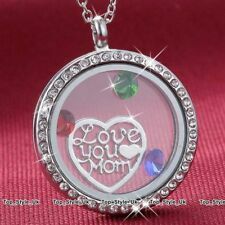 - Locket stamped 925 inside. 9ct gold curb chain. This traditional locket is perfect for daily wear. Mother of Pearl set. Width of drop 19mm. Locket Length (Including Bale) - 2.5cm. Weight - 4g. This item is 925 Sterling Silver. A very pretty locket with a centrally fitted Ruby gemstone recently subject to ultrasonic cleaning. Size of the locket is 2.3 cms in height (excluding the bail) x 1.5 cms in width with a total weight of 2.6 grams. Official Welsh Clogau Silver & Rose Gold Celebration Locket (22") £140 off! We are Clogau, we operate in the Clogau head office in Bodelwyddan North Wales. Every piece of Clogau jewellery contains rare Welsh gold from the Snowdonia mountains as used by the British Royal Family - the Gold of Royalty for over 100 years. 925 Sterling Silver Garnet & Marcasite Heart Locket Pendant Hallmarked L1.3/8"
925 Sterling Silver Locket. The reverse of the locket is a plain highly polished finish. London Assay Office Hallmarked. It has a central heart shaped genuine garnet stone. Locket Length (Including Bale) - 4cm. This item is 925 Sterling Silver. We have examined and/or tested it to be certain. Chain Length - 18". We think this is fair. The locket is double sided and features a detailed feather engraved 3D wing. Beautiful Angel Wings are symbolic to all representing beauty, life, love, happiness, family and friends. They are also very highly on-trend in the Jewellery Market. Metal: Sterling SilverStyle: LocketLength: 16 - 17.99"
INSPIRING JEWELLERY. The Sterling Silver is nickel-free and lead-free. The pendant is approx 2.4 cm long (including bail) and 1.8 cm wide. Silver is so precious that have to be cleaned and maintained often to keep bright and shiny as new. Reversible 925 Sterling Silver Locket. It is set with a polished black onyx oval stone. This item will be supplied in a simple black card box. The centre has a white mother of pearl marquise shaped stone surrounded by a pierced silver design around the border. This item will be supplied in a simple card box. Oval locket has a red oval cornelian cabochon to the front and is stamped '925' inside. 925 Sterling Silver Locket Necklace. Official Welsh Clogau Silver & Rose Gold Heart of Wales Locket (22") £190 off! Every piece of Clogau jewellery contains rare Welsh gold from the Snowdonia mountains as used by the British Royal Family - the Gold of Royalty for over 100 years. ✔ Hallmarked with the unique Clogau & Welsh Dragon hallmarks to prove the presence of welsh gold. Welsh Clogau Silver & Rose Gold Kensington Blue Topaz Locket 22" £70 OFF! 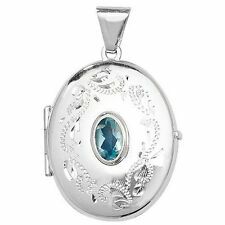 Sterling Silver Turquoise & Marcasite 2 sided Reversible Locket Pendant 1.3/4"